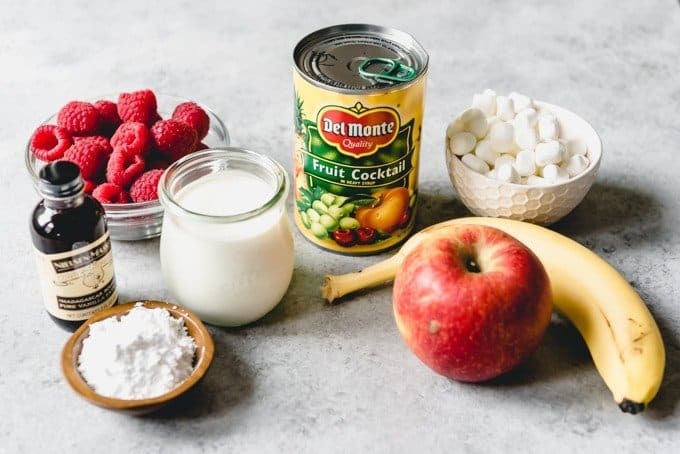 This easy and delicious Fruit Salad with Marshmallows and Whipped Cream is one of our favorite appetizers or side dishes to serve with dinner. 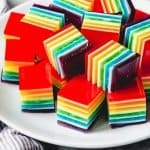 Okay, it’s pretty much a dessert, but since it’s called a salad with eat it with dinner and don’t feel a bit bad about it! Our youngest daughter, Rose, turned 5 in January. I asked her if she wanted to take something special to preschool to celebrate her birthday and offered to make her favorite chocolate cupcakes. 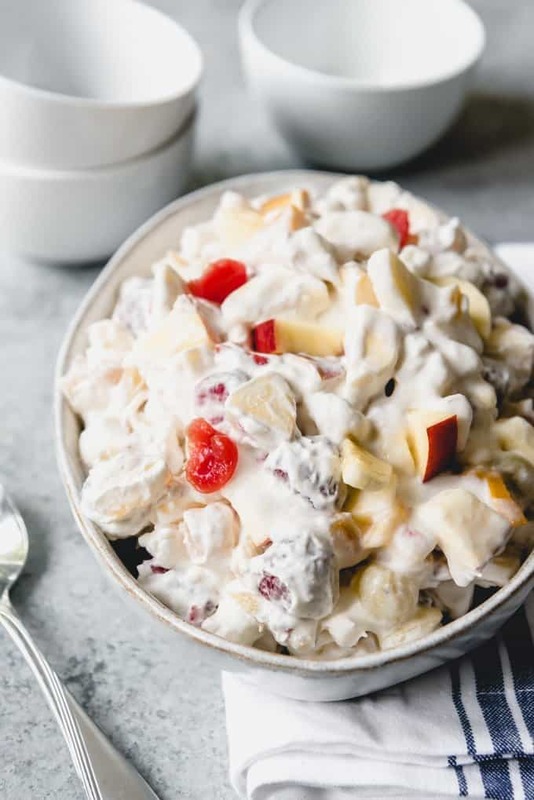 Which she bluntly shot down, instead declaring this fruit salad with marshmallows and whipped cream to be her food of choice for sharing with her preschool friends. I asked if she was sure. I gave her a couple of days to think it over. But she was adamant that her friends at preschool were going to LOVE fruit salad for her birthday and she did not want cupcakes instead. So I picked up a bunch of individual sized disposable containers and made a triple batch of this easy fruit salad recipe that I have been enjoying ever since I was a kid and we took it to school. We have Rose in the same co-op preschool that her big sister went to, which means I volunteer in class a couple times a month. I love it and Rose always looks forward to those special days when I get to wear one of the designated helper aprons and she has special duties to do with me like collecting trash after snack. There were definitely a bunch of confused looks when we said we were celebrating Rose’s birthday and started handing out plastic spoons and containers full of this fluffy stuff. Some kids even said there was no way they were eating it. But by the end, all of them were in raptures at the simple deliciousness and joy of the light, creamy, and sweet fruit salad that was generously studded with marshmallows. And Rose was delighted, which was what really mattered to me. 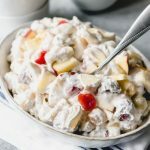 We love fruit salad and during the summer months I make a fruit salad with a honey lime poppy seed dressing that is so fresh and bright and yummy. 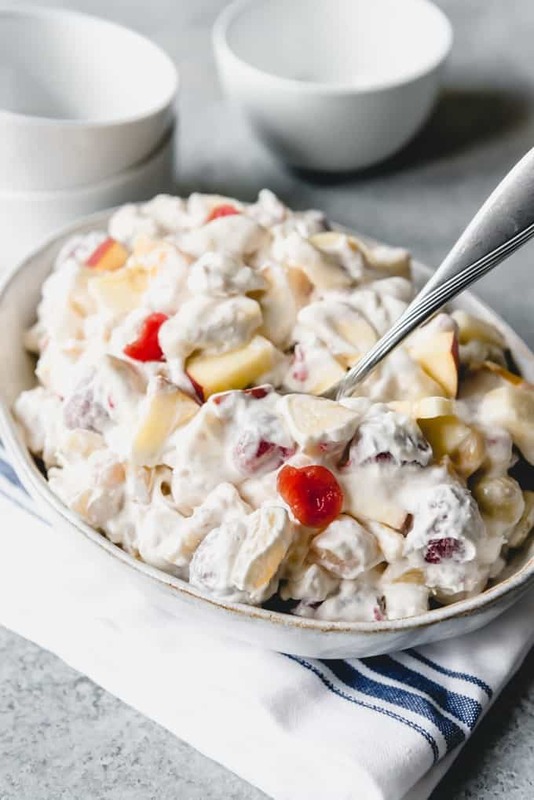 But during the winter when the quality of fruit just isn’t the same, we often make this sweeter, creamy fruit salad with cool whip or whipped cream version instead. There is really not much to this recipe at all. 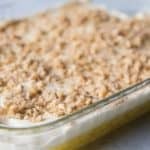 In fact, I’ve never used a recipe for it in my life since I just grew up helping my mom in the kitchen and she’s the one who taught me to make this by combining a drained can of fruit cocktail with a bit of fresh fruit and some sweetened whipped cream. But I measured and took notes this time around so I could write it up for any of you who have never had the chance to enjoy the amazingness that is old-fashioned fruit salad made with fruit cocktail. We always combine a can of fruit cocktail, which makes the base of the fruit salad, with at least two fresh fruit ingredients as well (always an apple and a banana in my family). 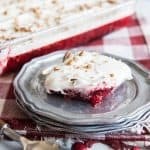 I’ve found that I also like to add some fresh berries if I have them on hand, and think raspberries are particularly good because of the tart bursts they add to the fruit salad. But blueberries or sliced strawberries are also good. The fresh fruit adds both a flavor contrast and textural element to the canned fruit cocktail, which tends to be all soft and difficult to distinguish the flavors of the classic combination of peaches, pears, grapes, pineapple, and cherries that are in it. Don’t get me wrong, I love that unique, classic flavor of the combination of fruits in syrup. 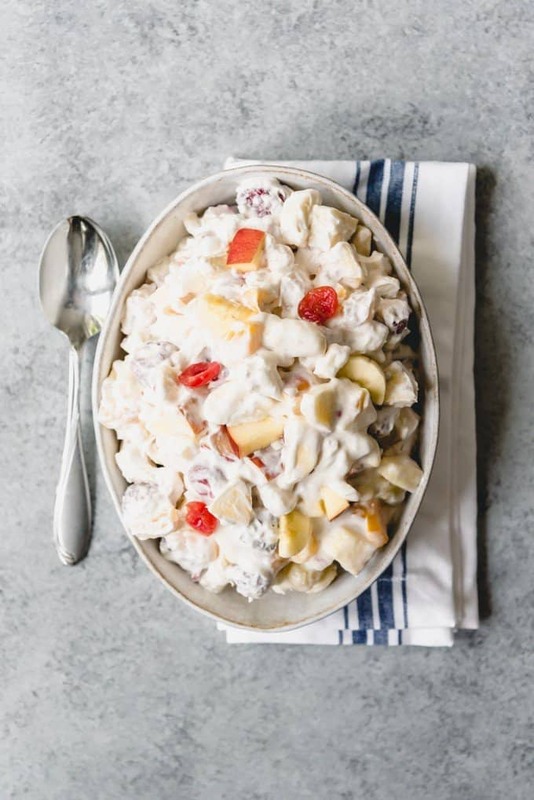 But the extra crunch from a diced apple, or the ripe banana flavor make a big improvement to fruit salad. I also always add a cup of marshmallows because I just love them. They make the salad extra fluffy and sweet. Growing up, we only got the marshmallows in the salad if my dad wasn’t home because he doesn’t like fruit salad with marshmallows. So you can leave them out if you prefer. 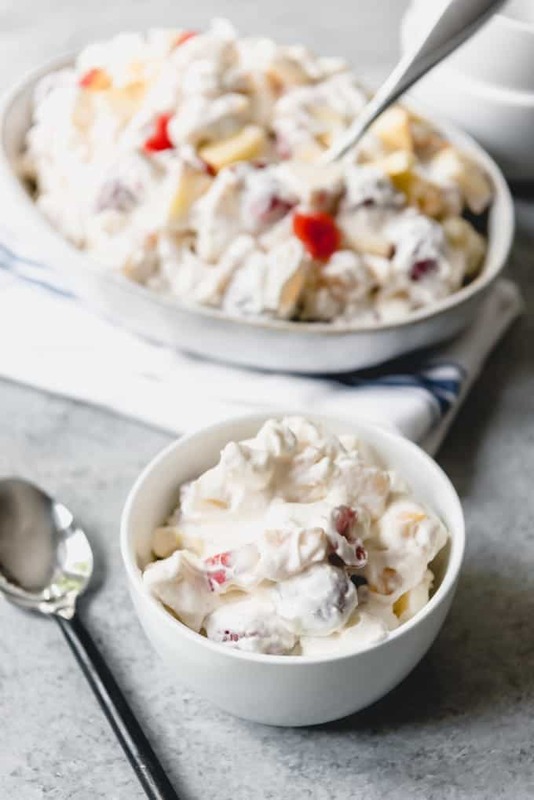 We typically make this creamy fruit salad with freshly whipped cream, but if you are in a pinch or don’t have whipping cream on hand, you can make this fruit salad with cool whip. To make the sweetened whipped cream, combine the cream in a cold bowl along with the powdered sugar and vanilla. 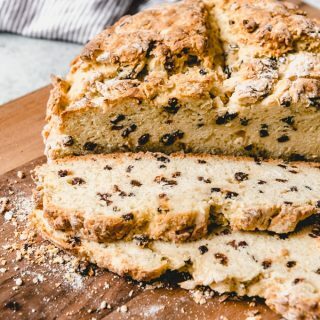 Beat using the whisk attachment of a stand mixer or with a handheld mixer until it thickens and becomes fluffy and light. Soft peaks should start to form and the whipped cream should mound on itself when you drop it by spoonfuls back into the bowl. Just don’t overmix the cream or it will turn buttery and will not coat the fruit salad as well. 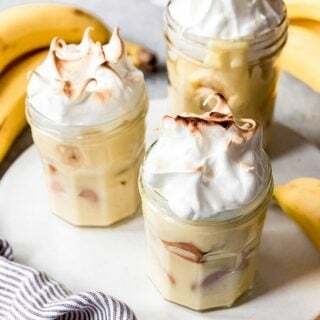 I have a strong preference for freshly whipped cream, but it does add that little bit of extra work and cleanup that can be avoided by using a small tub of Cool Whip that has been thawed in the fridge. What fruits are in a fruit cocktail? 30% to 50% diced peaches, any yellow variety. 25% to 45% diced pears, any variety. 6% to 16% diced pineapple, any variety. 6% to 20% whole grapes, any seedless variety. When I was a kid, there was usually only 1, maybe 2 cherries in each can of fruit cocktail and they were the most coveted item. Luckily, I feel like the canned fruit manufacturers are more generous with the maraschino cherries these days, which makes me (and my kids) happy. You can buy fruit cocktail where the fruit is canned in heavy or light syrup, or get the kind that is packed in its own juice or water instead. Either way, you will want to drain the fruit well. 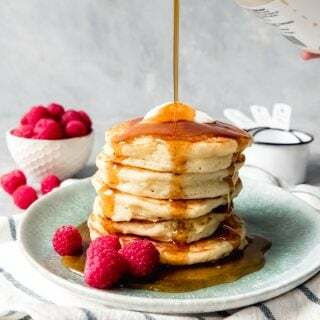 If it was packed in heavy syrup, it’s not a bad idea to give the fruit a quick rinse to remove some of the extra sugar. Why is it called fruit cocktail? I think when most people think of a cocktail, they are thinking of a mixed alcoholic drink. 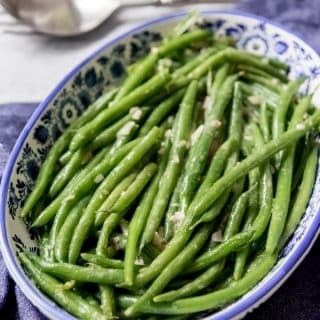 But there is a secondary definition which is a dish made of small pieces of food that is typically served cold, such a chopped fruit or seafood. What do you serve fruit salad with? 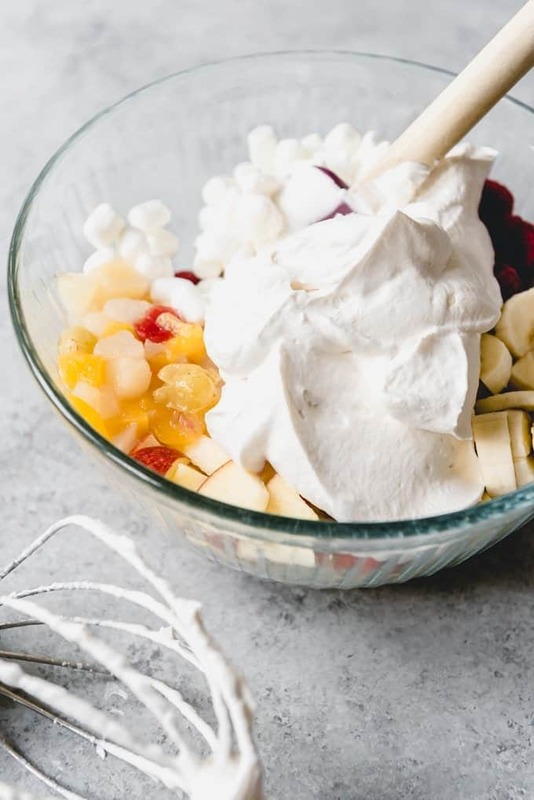 I feel like this fruit salad with marshmallows and whipped cream goes with almost anything. 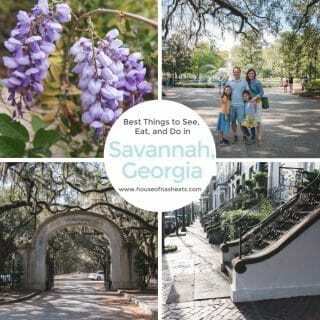 But protein-centric, savory dishes are what typically make me wish I had a bowl of creamy fruit salad to go with it. 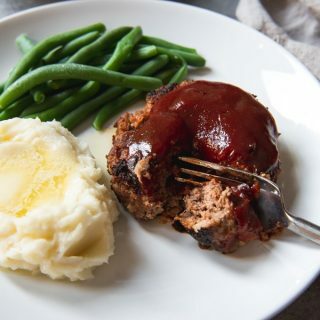 Here are some of the dinners that I almost always think of serving with fruit salad on the side. 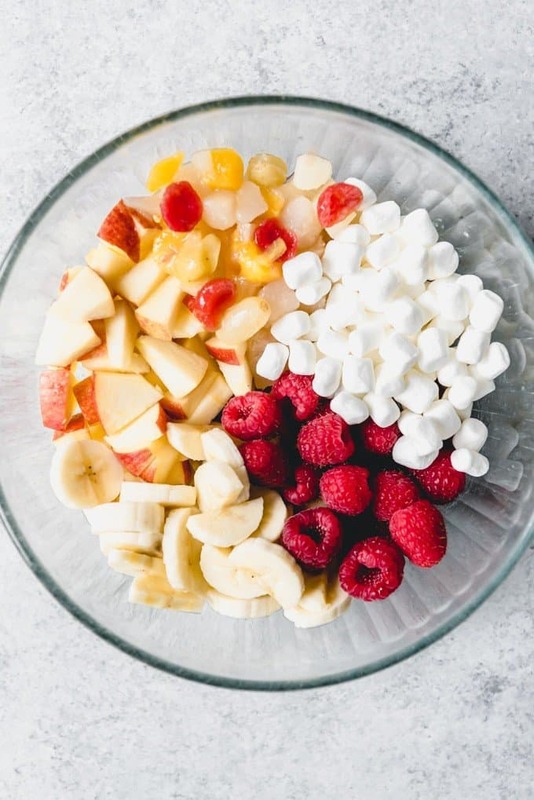 Combine the drained fruit cocktail, apple, banana, marshmallows, and raspberries in a large bowl. 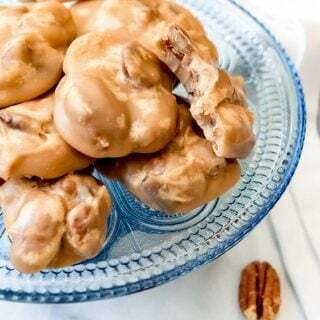 In a separate bowl, whip the cream with the powdered sugar and vanilla using a stand mixer or handheld mixer fitted with a whisk attachment until light and soft. Add the whipped cream to the mixed fruit and marshmallows and fold to combine. 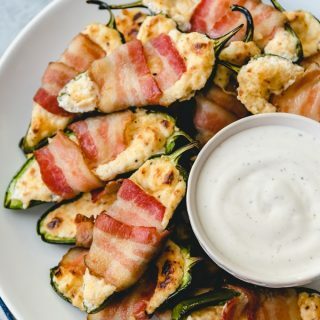 Serve immediately or keep chilled in the fridge. Best served the day it is made.